Roaring Spring, PA: A ribbon cutting for the new Central High School Gymnasium was held on Tuesday, January 15, 2019, 7:15 p.m. prior to the Central High School Boys’ Varsity basketball game against Tyrone Area High School. 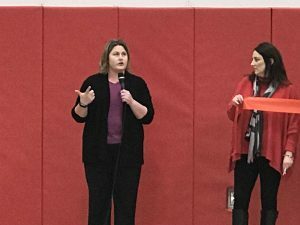 The event celebrated the combined efforts of Central High School and their community in the completion of their gymnasium renovation project. According to Brian Gahagan, Spring Cove School Board President, the former gymnasium received significant water damage after a weekend of rainstorms in September of 2018. The 59-year-old floor was original to the building and had exceeded the lifespan of 50 years. Repairing only the damaged area was deemed impractical and not cost effective which led to the School Board to approve replacing the entire floor. Miller Flooring Company, Inc. of West Chester, PA was awarded the project with an estimated total cost of $275,000. The new gym floor has several unique features including an AACER PowerVent Airflow System under the floor humidistat, which triggers fan units to begin circulating air if moisture is detected. This feature proactively protects the new floor from water damage. 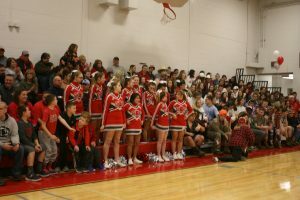 Although the bleachers did not sustain water damage, they were already slated for replacement in the summer of 2019 and the Board approved their immediate replacement as part of the project. The red Interkal Motorized Telescoping Bleachers have a seating capacity of 602 (including ADA seating), in comparison to the prior 544 seats. In addition, new red wall pads were purchased with the cost being offset by contributions from Central Athletic Booster Groups, which include a $500 donation from Curry Supply. 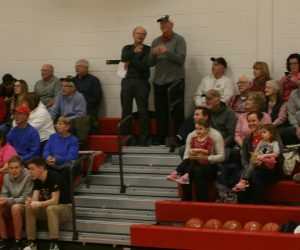 The Dragon Pride Foundation made a new Scorer’s Table possible. Scott King, Dragon Pride Foundation Vice President, was present to affirm their donation of $3,578.75 to purchase the new table that will arrive soon. “The Dragon Pride Foundation through our fundraising efforts and community donations strives to support the education of all students K-12 of the Spring Cove School District by providing opportunities for enhanced educational, arts, and athletic programs while bolstering school pride throughout the Spring Cove Community. We are happy to contribute the new Scorer’s Table to this newly renovated gymnasium,” shared King. Stacy Kuster, Spring Cove School District Athletic Director, had the honor of cutting the ribbon along with an energized group of supporters including Dr. Betsy Baker, Spring Cove School District Superintendent; Chrissy Dively, Morrisons Cove Rotary Club Vice President; Scott King, Dragon Pride Foundation President; Stephanie Thompson, Central High School Principal; Brian Gahagan, Spring Cove School Board President; Spring Cove Dragon; Noah Muthler, Central Spring Cove High School Boys’ Basketball Team/Boosters; Rob Mock, Central Spring Cove High School Girls’ Basketball Team/Boosters; Dave Marko, Spring Cove High School Wrestling Team/Boosters; Sue Heuston, Central Spring Cove High School Girls’ Volleyball Team/Boosters; Christine Wyant, Central High School Boys’ Volleyball Team/Boosters; and Emmie Garver, Central Spring Cove High School Cheerleading Squad/Boosters. For more information on the Central High School Gymnasium renovation project, please contact Dr. Betsy Baker at 814-224-3060 or email at bbaker@springcovesd.org. 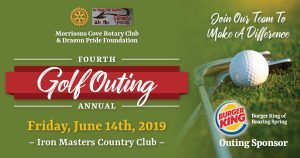 Save the date, Friday, June 14, 2019, for the fourth annual Golf Outing benefiting the Morrisons Cove Rotary Club and the Dragon Pride Foundation. Funds raised will be donated to support Morrisons Cove nonprofit groups in enhancing our community and its resident’s lives. Both organizations make the most of every donation they receive. Collectively they support numerous educational and athletic programs, and volunteer at numerous community events. Click Here to Download the Third Annual Golf Outing Brochure. For more information contact Tom Kozminski 814-381-2909 or email tom.kozminski@morefield.com. 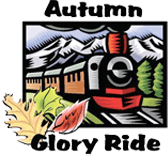 Tickets will soon be on sale for the Autumn Glory Ride Scenic Train Excursions, which will take place on Saturday, November 2. The Morrisons Cove Rotary Club sponsors the train ride. Tickets will be available at the Roaring Spring True Value or by phone reservation at 800-332-1543 with ticket pick-up at either the Roaring Spring True Value or the Roaring Spring Water Store. Now in their ninth year, the Autumn Glory Rides are a beloved family tradition for many local residents and visitors. Participants enjoy scenic views and immerse themselves in local history as their train winds through the Allegheny Mountains of Blair County. The Morrisons Cove Rotary Club uses the proceeds raised by the excursions to support many causes in the Morrisons Cove area, including numerous youth programs. Excursion tickets are only $12 per rider and all seats are reserved. Children under three may sit on an adult’s lap at no additional charge. Riders may choose one of three excursion times: 10:00am, 12:30pm and 3:00pm. The train will depart from Roaring Spring’s historic train station, located across from the World-Famous Spring and travel towards Hollidaysburg. Riders will disembark at Monastery Road for a historical presentation. The length of the ride is about 1.5 hours including the return trip to the train station. The excursions feature authentic train coaches owned and operated by the Everett Railroad Company of Duncansville. Light food and beverages will be available at the Train Station including ice cream to benefit the Roaring Spring Historical Society. For more information on the Autumn Glory Ride, email the Morrisons Cove Rotary Club at info@mcrotary.com. Club members of all ages volunteer to maintain clean roadways and ‘keep America beautiful’ at locations in the Morrisons Cove area. 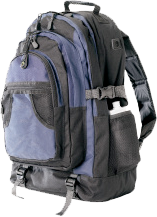 Morrisons Cove Rotary Club members’ involvement in the Scarlet Dragon Pack Program is a collaboration with other community churches and organizations, as well as with other community-interested people. Several of the club’s members have an active role weekly or bi-weekly, while remaining Rotarians volunteer monthly to help stuff food bags and distribute food to Roaring Spring Elementary and Martinsburg Elementary Schools. 2018 Rotary Recognition Day included a full page in the Altoona Mirror and posters of the full page distributed around the Cove featuring the Morrisons Cove Rotary Club and event sponsors, and special mentions of our sponsors and programs on our Club’s Facebook page. Rotary Recognition Day is an annual event and one of our major fundraising endeavors, which enables us to accomplish our goals. Rotary Recognition Day creates awareness and informs the public of our many charitable causes, while also recognizing those who support Rotary financially. From presenting dictionaries to third grade students to helping to eradicate polio through our Rotary International Polio program, the Morrisons Cove Rotary Club donates thousands of dollars and many hours of time annually to support dozens of important programs. We thank all of our sponsors and Club members for their support and hard work to make 2018 Rotary Recognition Day another success. On July 12, 2016 the Morrisons Cove Rotary Club celebrated its 90th anniversary of Rotary in the Cove as well as recognizing its past presidents with a dinner at The Bistro in Martinsburg. The event was attended by the newly installed District 7360 Governor, Richard Drukker, and the new Assistant District Governor, Pamela Wilt and their spouses. its goal of total eradication of this disease. to The Bistro. Wine and beer donated by members were available for a short social period prior to dinner. Rotarians took the opportunity to meet the new District leadership and get reacquainted with the spouses of our local members. The Bistro provided a perfect setting and service for the occasion. Kent Martin of Altoona provided wonderful music background for the gathering. 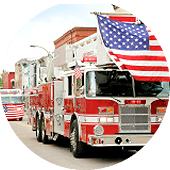 MCRC participates annually in two community parades: the Roaring Spring Community Fireman’s Parade and the Martinsburg July 4th parade.